Welcome to dressed®, the world’s most innovative and stylish dining experience created for today’s health-conscious eaters. We offer salads with style, artisan sandwiches, paninis, homemade soups & smoothies – all tailored just for you in a crisp, clean, contemporary environment. INNOVATIVE – At dressed®, you are the curator of your own meal. Step up to our friendly connoisseurs who create custom-tailored salads according to your daily whim – or simply choose from one of our ‘Chef Designed’ salads created by our Executive Chef, Justin Smolev, who has worked at some of America’s greatest restaurants. 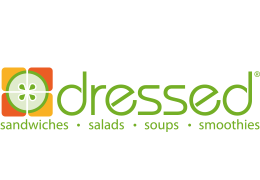 With over 70 gourmet salad ingredients and 24 original interpretations of classic dressings, dressed® offers up combinations that never cease. If you’re not feeling like a salad, we offer artisan sandwiches, hot paninis, and homemade soups made fresh daily. You can even add a boost to your day with one of our freshly blended smoothies. STYLISH – When you step into dressed® you step into a world of style. With locations and influences that span from urban America to the bustling financial district of Hong Kong, we’ve fashioned together a distinct, contemporary design that awakens your senses with a hip, chic feel and a color palette as bold as our menu. We’re serious about our dining environment and want our customers to enjoy the spoils of our research. Dine and work. Dine and don’t work. At dressed® you can login to our free wifi, kick back to our groovy beats, and people watch our fabulous clientele while relaxing in our serene social space. Feel the world converge in the coolest setting with the most comprehensive menu in town. HEALTH-CONSCIOUS – “You are what you eat!” – Quite the cliché statement but, one we all know is clothed in truth. At dressed®, we love great tasting food. We have trained around the world to bring our customers what they desire most: meals that help you feel better; renew your energy and give you sound piece of mind as you contribute to your own health and well-being.